It might feel like you are standing on the edge of the world when you make reservations for a North Myrtle Beach vacation rental at Inlet Point Villas. This fantastic North Myrtle Beach resort is located at the northernmost point of the Cherry Grove section of North Myrtle Beach, South Carolina. A sandy beach wraps around this North Myrtle Beach resort that stretches from the Atlantic Ocean to the salt marsh. Your family will have views from all sides of the waterfront and also a centrally located swimming pool to boot! Follow North Ocean Boulevard all the way from Sea Mountain Highway to the very end. It is a peaceful setting because most sides of this North Myrtle Beach resort neighbor water. The landscape at this North Myrtle Beach resort is filled with palm trees and the pool deck is laden with chairs so you can relax in the sunshine and get a good tan. The tranquility of the salt marsh permeates Inlet Point Villas while the roar of the Atlantic Ocean and its crashing waves is just steps away. 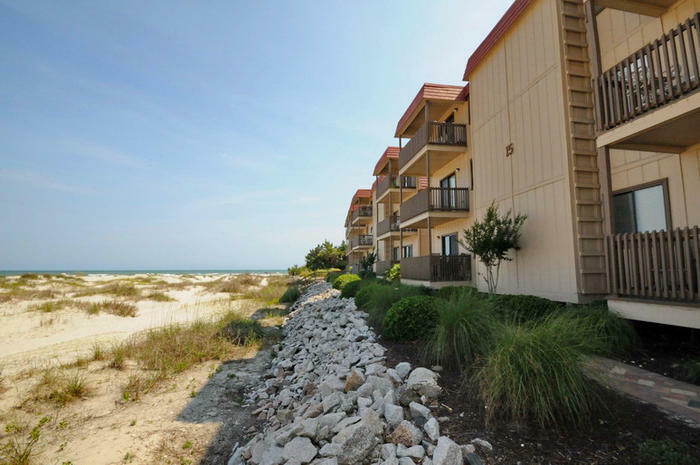 The North Myrtle Beach rentals at Inlet Point Villas are plentiful. Choose from a one-bedroom North Myrtle Beach condominium, a two-bedroom North Myrtle Beach vacation rental or a three-bedroom North Myrtle Beach condo rental at Inlet Point Villas. These condos in North Myrtle Beach, South Carolina accommodate anywhere from four to eight people most comfortably. This North Myrtle Beach resort is a gated community. Inlet Point Villas is a charming waterfront neighborhood of 15 separate buildings, each with three floors of North Myrtle Beach condominiums. There are only six North Myrtle Beach condominiums in each building so the entire North Myrtle Beach resort is rather quaint. All 15 buildings are waterfront with some facing the Atlantic Ocean and the majority facing the inlet. In the middle of these North Myrtle Beach vacation rentals is a sparkling blue swimming pool and tennis courts. Splash and play in the swimming pool when the weather warms up and hit the tennis courts when you feel like lobbing balls and working on your game. The accommodations at Inlet Point Villas are nice. These North Myrtle Beach vacation rentals are beautifully furnished and tastefully decorated. Whether you are spending a beach vacation at this North Myrtle Beach resort with your family or friends, you will feel at home in these North Myrtle Beach condo rentals. Amenities in these North Myrtle Beach rentals include a fully furnished kitchen with a dishwasher and a microwave. Life will be easy with such appliances around during your North Myrtle Beach vacation. Some of these condos in North Myrtle Beach, South Carolina have high-speed Internet access and most of them feature at least one DVD player. All of the North Myrtle Beach condo rentals at Inlet Point Villas have a washing machine and clothes dryer. Elliott Beach Rentals is not affiliated with onsite management or the HOA of Inlet Point Villas.